© 1985. Published by Canadian Information Processing Society. 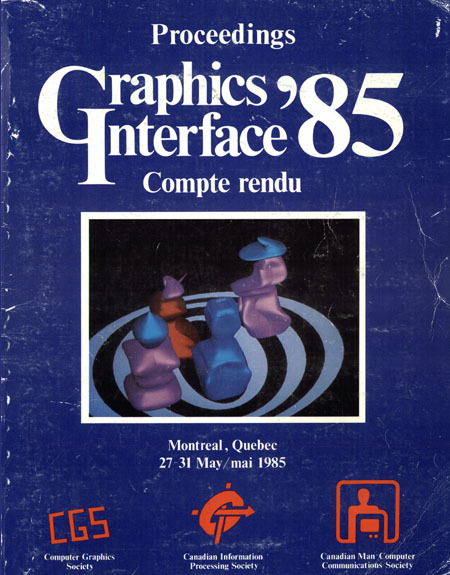 Graphics Interface ’85, the 11th CMCCS conference, was the first truly international computer graphics conference in Canada. For the first time, the conference was presented jointly by the CMCCS and the Computer Graphics Society, a society with sections in Japan, Europe, the United States and Canada. This gave the conference an international scope. Papers were submitted from Canada. the United States, Japan, United Kingdom, France, Germany, Italy, Switzerland, Hong Kong, among other countries. Image synthesis: Optical identity or pictorial communication?